Howstuffworks.ocm explains how desertification works. Drought and desertification in the Great Plains states in the 1920s forced many farmers to move from the Dust Bowl to more fertile ground. In the 1920s, the United States entered an economic recession. Farmers in Western states tried to raise profits by plowing and planting more acreage with new mechanized farming methods. Within a decade, a massive drought hit the entire country. Strong winds swept across the Great Plains, stirring up loose topsoil that had been displaced by overplowing and overgrazing of cattle. The results were dozens of epic dust storms that swallowed whole cities in blinding black clouds. The semiarid soil of the plains, which had fed generations with its fertile soil, was now a lifeless desert known as the Dust Bowl. The Dust Bowl is a perfect example of desertification, the degradation of dryland ecosystems through a combination of natural and human causes. Droughts are an unavoidable occurrence in semi-arid regions like the Western United States, large portions of sub-Saharan Africa, Central Asia and Latin America. But over the millennia, these fragile ecosystems have discovered ways to survive. The real problem is when human beings try to take too many resources from land that can sustain very little human life. When we talk about desertification, we're not only talking about the slow spread of existing deserts, but the creation of entirely new ones. When too many people try to plant crops, graze cattle and harvest firewood in a fragile dryland ecosystem, they tip the balance of sustainability. The result is that new deserts are growing at a rate of 20,000 square miles (51,800 square kilometers) a year. Nearly half of the world's total land mass is composed of dryland ecosystems, areas defined by low annual rainfall and high temperatures. It's estimated that 10 to 20 percent of these regions are already degraded -- unsuitable for human, animal or plant life [source: GreenFacts.org]. Dryland regions are also home to billions of the world's poorest, most marginalized populations. Desertification leads to famine, mass starvation and unprecedented human migration. As people are displaced by new deserts, they are forced into even more unstable regions, where the desertification process continues. Desertification is one of the world's most pressing environmental issues, but it's not irreversible. Decades after the Dust Bowl, federal conservation programs were able to restore the Great Plains to fertility. Keep reading to learn more about the causes and effects of desertification as well as the best methods for bringing it to a halt. Desertification we are seeing today isn't a new phenomenon caused by global warming. It is the natural consequence of abusing the land in dry regions. The US saw desertification in the Great Plains because of such abuse during the 1930's. Cimarron County Chamber of Commerce reports about the 1930's Dust Bowl. Excerpts from "The Dust Bowl, Men, Dirt and Depression" by Paul Bonnifield. "Dust Bowl" was a term born in the hard times from the people who lived in the drought-stricken region during the great depression. The term was first used in a dispatch from Robert Geiger, an AP correspondent in Guymon, and within a few short hours the term was used all over the nation. 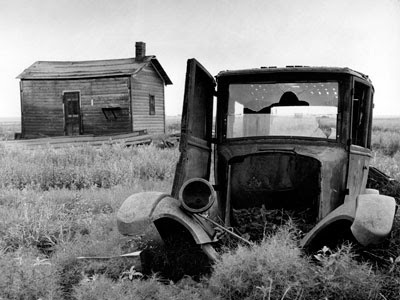 The "Dust Bowl Days", also known as the "Dirty Thirties", took its toll on Cimarron County. The decade was full of extremes: blizzards, tornadoes, floods, droughts, and dirt storms. A giant dust storm engulfs Boise City. Cyclic winds rolled up two miles high, stretched out a hundred miles and moved faster than 50 miles an hour. These storms destroyed vast areas of the Great Plains farmland. The methods of fighting the dust were as many and varied as were the means of finding a way to get something to eat and wear. Every possible crack was plugged, sheets were placed over windows and blankets were hung behind doors. Often the places were so tightly plugged against the dust (which still managed to get in) that the houses became extremely hot and stuffy. The clouds appeared on the horizons with a thunderous roar. Turbulent dust clouds rolled in generally from the North and dumped a fine silt over the land. Men, women and children stayed in their houses and tied handkerchiefs over their noses and mouths. When they dared to leave, they added goggles to protect their eyes. Houses were shut tight, cloth was wedged in the cracks of the doors and windows but still the fine silt forced its way into houses, schools and businesses. During the storms, the air indoors was "swept" with wet gunny sacks. Sponges were used as makeshift "dust masks" and damp sheets were tied over the beds. Black Sunday April 14, 1935. The dust storm that turned day into night. Many believed the world was coming to an end. 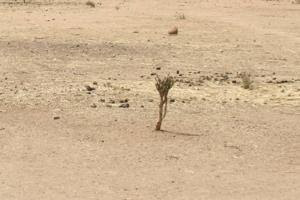 InDepthNews reports that humanitarian disaster feared as desertification spreads. The reduced capacity for food production has brought a population of over 200 million people to the verge of calamity. BERLIN/NAIROBI (IDN) - Environmental experts are warning of an impending humanitarian disaster in Africa, emerging from creeping desertification. If unchecked, it would undo remarkable social and economic progress achieved over decades and wipe millions off the face of the continent. Desertification is defined by the United Nations Convention to Combat Desertification (UNCCD) as land degradation in arid, semi arid and humid areas arising from various factors such as climatic variations and human activities. These include over-cultivation, overgrazing, deforestation, poor irrigation practices and other factors leading to inappropriate land use. Because of those practices, the effects of desertification are already being felt across Africa, says Michael Bernard Kwesi Darkoh, a leading authority on desertification and professor of geography at Nairobi's Kenyatta University. At least 25 countries have faced serious food shortages in the past decade as a result of extended drought, says Darkoh in a paper titled 'Desertification: the scourge of Africa'. "The reduced capacity for food production has brought a population of over 200 million people to the verge of calamity," says Darkoh. "Some have died of starvation, and among the survivors, especially the children and young people, many will suffer impaired health for the rest of their lives," he adds. And this, on a continent already wracked by disease, civil strife and political upheaval, a continent grappling with the challenge of providing basic healthcare to its population. Save for the Antarctica, desertification affects all continents. At least 23 per cent of Asia's total land area is severely or very severely affected by desertification, with 42 per cent of the continent's population living in drylands. The economic costs of desertification on the continent run into billions of dollars, with an estimated gross annual income loss of $20.9. About 35 per cent of the Africa's total land area, and at least 65 per cent of the population is affected by desertification. Howstuffworks.ocm explains the causes and effects of desertification. The root cause of desertification is poor soil conservation leading to soil degradation. Healthy, productive soil is rich with organic matter called humus. Humus is formed when decaying organic materials like dead plants and animals are transformed by micro-organisms and fungi into soil that's rich in essential nutrients like carbon, nitrogen, phosphorous and sulfur. Perhaps the greatest cause of soil degradation and desertification is an explosion in world population, particularly in developing countries. Throughout the 1990s, dryland regions experienced a population growth of 18.5 percent, mostly in desperately poor, developing nations. In their daily struggle to survive, these expanding populations have put a deadly strain on their environment. Hum an activities also exacerbate the biggest problem of living in a dryland region: lack of rainfall. When land is cleared of plant life, either from overgrazing or logging, the bare surface of the Earth reflects more of the sun's light back into the atmosphere, creating even hotter temperatures. In semiarid regions, higher temperatures cause a higher rate of evaporation, which means even less rainfall. Also, all of the dust kicked up by cattle and the smoke created by wildfires introduces heavy particles into the atmosphere that make it more difficult for rain drops to form. I don't think the paragraph above explains does a good job explaining how desertification reduces rainfall, so below is another explanation. The overwhelming effect of desertification on the surface and atmospheric energy balance comes from disruptions to the hydrological cycle. In many cases, removal of vegetation leads to increased runoff and potential evapotranspiration rates due to higher surface and near-surface temperatures, higher near-surface wind speeds and lower near-surface atmospheric moisture levels. The increase in runoff and evapotranspiration rates then leads directly to a decrease in soil moisture and a rapid decrease in amount of energy used to evaporate or transpire water into the atmosphere. When less energy is consumed in the latent heat term, LE, of the energy balance equation, more energy is available for heating the ground, G: or heating the air, H. The Bowen ratio, defined as H/LE, typically increases in areas where desertification is occurring. These changes to the energy balance associated with modifications to the hydrological cycle, in many cases dwarf the effects associated with albedo, surface roughness and dust in the atmosphere. Phillips (1993) summarized this by suggesting that soil moisture levels in drylands are directly related to vegetation cover, precipitation and water erosion; and negatively related to albedo, temperature and aeolian erosion. Basically when land is cleared of plant life, the sun heats the land a lot faster, leading to higher temperatures and less rain. ­Who is Affected by Desertification? ­An overwhelming 90 percent of the people who live in dryland ecosystems -- those areas most prone to soil degradation and desertification -- are citizens of developing countries. This adds up to 2 billion people, mostly poor and marginalized, who are immediately affected by the deadly consequences of desertification. Experts estimate that more than 24,000 people die every day from starvation. The worst sufferers are populations living in the dryland regions of sub-Saharan Africa and Central Asia. It's estimated than more than 70 percent of drylands in Africa, Asia and Latin America that are being used for agricultural purposes are already experiencing the effects of desertification. The infant mortality rate in a dryland developing country is 10 times the rate of an industrialized nation. When experts talk about the causes and effects of desertification, they talk a lot about ecosystem services, the resources that an environment offers to its inhabitants. People living in marginal dryland regions depend much more heavily on their local ecosystem services than people in developing countries. In the United States, for example, much of the food we eat and fuel we use comes from other regions or even other countries. In a country like Burkina Faso in sub-Saharan Africa, everything comes from the immediate surrounding area. There is no money or infrastructure to import food and fuel. So when the local conditions worsen through soil degradation and desertification, the impact on the lives of the people is far more severe. The only way to avoid starvation is to move to another area that hasn't been entirely degraded yet. This continuous mass migration of people into fragile regions speeds up the desertification process exponentially. But the effects of desertification are also felt by millions of people living far from the immediate dryland zones. One effect is the mass migration of people from rural areas to already overpopulated cities. This contributes to sprawling slums that are breeding grounds for disease. It's estimated that 50 million people will be displaced by desertification in the next decade. Dust storms from the Gobi desert in China create poor air conditions in Beijing, and the dust fallout from larger storms has been detected as far away as North America. Dust storms have been proven to trigger allergic reactions and asthma attacks and have a particularly negative health impact on children and the elderly. The larger effects of desertification can be felt on a global level. Investigations into the cause of the global food crisis of 2008 point to desertification as one of its sources. Degradation of available farmland contributes to less food production and higher prices for staple crops like rice, wheat and corn. In March 2008, the price of wheat was up 130 percent from a year before and the price of soy was up 87 percent. For those countries that can't produce their own food due to soil degradation, they can no longer afford to import. 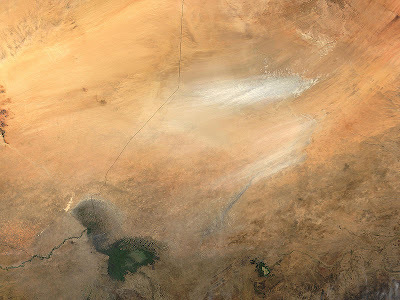 ­Is it possible to slow the progress of desertification or even stop it completely? Environmental experts say yes, but it will require a worldwide campaign to improve agricultural methods, regenerate plant life and conserve precious soil fertility. The first step is to replace destructive agricultural techniques at the grassroots level. Poor farming communities in developing countries need to be taught the long-term benefits of crop rotation, the use of legumes and other cover crops to "fix" nitrogen back into the soil, sustainable irrigation methods, and techniques like terracing, which prevent water runoff and erosion in hilly, sloping landscapes. Planting millions of trees in strategic locations could do wonders for halting the expa nsion of current deserts and preventing the creation of new ones. The Chinese government is currently planting a nearly 3,000-mile-long (4,828-kilometer-long) belt of trees along the edge of the Gobi desert to put the brakes on dust storms and prevent dune migration. A similar "green wall" is being considered along the frontier of the Sahara. On a smaller scale, simply planting trees around fields will cut winds that contribute to erosion of topsoil. Gluckman.com reports about Beijing's Desert Storm. Few people think of China as a desert nation, yet it is among the world's largest. More than 27%, or 2.5 million square kilometers, of the country comprises useless sand (just 7% of Chinese land feeds about a quarter of the world's population). A Ministry of Science and Technology task force says desertification costs China about $2-3 billion annually, while 800 km of railway and thousands of kilometers of roads are blocked by sedimentation. An estimated 110 million people suffer firsthand from the impacts of desertification and, by official reports, another 2,500 sq km turns to desert each year. This is nothing new, of course. In the 4th century B.C. Chinese philosopher Mencius (Mengzi) wrote about desertification and its human causes, including tree-cutting and overgrazing. Experts argue over the reasons and consequences, but all agree that Chinese deserts are on the move. Sand from the distant Gobi threatens even Beijing, which some scientists say could be silted over within a few years. Dunes forming just 70 km from the capital may be drifting south at 20-25 km a year. Conservative estimates say 3 km a year. And despite massive spending on land reclamation and replanting, China is falling behind. In the northwest, where the biggest problems lie, desertification has escalated from 1,560 sq km annually in the 1970s to 2,100-2,400 sq km in the 1990s. According to many environmentalists, Beijing has been largely content to issue proclamations about student-supported tree-planting rather than tackle complicated land issues. The government responded with huge "greening" campaigns and in the past 20 years alone, according to the People's Daily, more than 30 billion trees have been planted. This year, however, the storms blew away any sense of security. Grasping the enormity of the problem is easy on the road north from Beijing to Langtougou. Nestling among fields of corn and sunflowers, villages bloom with flowers. After two hours' driving, the views are still green. But over one steep mountain a surreal landscape astounds the eyes. Mountains rise on both sides of the valley ahead, but the hills are an ugly gray, denuded of vegetation. Even weirder, hillsides are dotted with white, much like highway stripes stretching into the horizon. The real shock hits on the descent into the valley. Those dots are actually white-painted stones, lining small pockets of soil. Inside each is a tiny tree. But the entire countryside has been stripped of grasses, topsoil and mature trees — meaning the saplings have little chance of survival. In Langtougou, residents are mumbling about new regulations as they dig huge pits in their yards to compost manure and waste to produce fuel. Each house must have one as part of a government decree against burning wood. Firewood collection (32.4%) is a key cause of desertification in northern China, according to a study by Chinese researcher Ning Datong and published by the University of Toronto. Ning attributed the other causes to excessive grazing (30%) and over-cultivation (23.3%). None of the 200 villagers is enthusiastic about their new composting brief, but what really upsets them are the other initiatives. Farming will cease, and they have also been told they will have to give up their animals. "This is how we live," says Li Guoyun, 50. "We have 50 to 60 goats. We sell the wool and some for food. Without them, we'll be ruined." Li realizes, of course, that his goats gobble up the grass that used to cover the valley floor and hillsides, "but they are so much easier than pigs or cows." Up and down the silted-in valley, the story is much the same. "I grow corn, rice, beans and tomatoes, to eat and to sell," says Zhang Baoguan, 43, a father of two from the nearby hamlet of Caonianguo. "Now, I'll have to stop. The government is promising some rice and money, but it's not enough." The moratorium on farming and grazing will apply throughout the valley — and nobody knows for how long. Villagers have already been drafted into China's new green army of tree-planters. "We'll plant trees every day for five years," Zhang says dejectedly. "And if that doesn't work, we'll plant for five more. That's what they tell us." Neighbor Lin Renrui fears that no amount of tree-planting will bring the valley back to life, since the government has no plans for the sand. "We don't like this plan at all — especially the part about the animals," Lin says. "The government told us we will have to sell them all." And the sand? "That's the real problem," he says, "not the goats. We ask about the sand. Nobody gives us an answer." Environmentalists in the capital, most of whom speak on the condition of anonymity, say Beijing is missing the big picture. Land and water use, grasslands and forests, desert and climate changes are all interconnected. "The response has really been fragmented," says one. Yet now that the government seems to be throwing its weight behind the issue, some critics call it overkill. "All of a sudden all you read about is desertification," says one foreign observer. "You have to wonder if it's not all propaganda, designed perhaps to win overseas funding for environmental campaigns." But what about all that sand, sweeping down from the Gobi Desert and threatening to swallow Beijing within a few years. "Silly," responds one official in the Ministry of Agriculture's ecology section. "There are real problems, but everything with desertification is exaggerated." He worries that the current focus misses the step-by-step approaches needed in a well-rounded environmental package. These include planting grasses first to stabilize and enrich soil, then trees. "But everything is going fast now and there is no masterplan." If ever there is a place to grasp the climatic and environmental changes in China, it is not out on the vast plains, where herdsmen and farmers battle over dwindling water resources and tillable land. Instead, it is along an odd stretch of towering sand dunes just 70 km northwest of the capital. In olden times, this area was a favorite hunting ground of the imperial family, with forests and lakes for picnics. Now the woods are gone. Nearby sits the junction town of Huailai — except that no one calls it that anymore. Even on the road signs it is Shacheng — Sand City. The changes also are stark in small villages such as Chai Yuan (Firewood Garden), about 25 km further northwest. From there it is just a few more kilometers to Flying Camel Desert, so named because some Chinese entrepreneurs have surrounded the sand with a fence and charge admission to tourists wishing to experience the desert. Not that it is much of a desert experience. There are dune buggies and motor bikes for careering over the dunes, a mock Mongolian yurt, and camels and Mongolian horses. Still, there is more at the Flying Camel than exists over the dunes, where huge waves of sand crash to a halt above Longbaoshan. The village of 800 people was set up in 1989 to house mountain folk — moved from nearby hills as part of a resettlement program. The new brick buildings seem impressive, but the village lacks life. "Nobody has any work," explains Zhang Wengui, 78. "We grow crops, some fruit and vegetables, that's about all." At least, that was about all. When farming was banned by Premier Zhu, officials swept in with their own version of Desert Storm. They introduced a desertification rehabilitation program, which, thus far, has consisted largely of fencing in the nearby sand and erecting signs proclaiming: "Controlling the Desert, State Focus Point." The farming prohibition was mostly a waste of time as well. Crops wilted long ago. "We have no water," says Zhang. The two village wells, dug deeper each year, have run dry. The people will likely need to be moved again. In the meantime, no prizes for guessing what they have been doing: planting trees. "It's part of a big campaign," says one villager, who recalls how the local Bank of China staffers joined in one day. They had no choice. "The officials just went in and told everybody: 'You have to plant trees today.'" It is a similar picture in thousands of villages across China, where population growth has meant rampant farming and wasteful irrigation. Yet if mass tree-plantings register far below the raging-success mark in Beijing's piecemeal fight to stave off the sands, they still look pretty good next to the efforts at Flying Camel Desert. While Longbaoshan villagers go thirsty, workers at the desert park are busy hosing down a dune so tourists can take a toboggan ride. Wafla.com offers a general description of desertification in Latin America. Despite the large fresh water reserves of the region, water resources are unevenly distributed both in space and in time, thus affecting their availability in vast territories. Many countries of the region have large areas with water shortage, stretching over 4.5 million square kilometers. 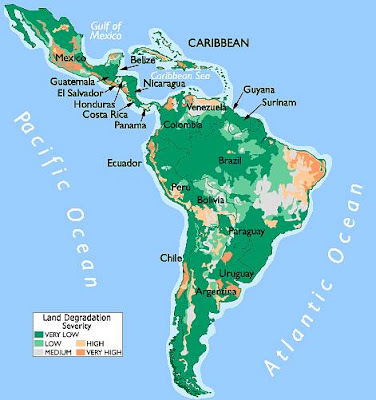 In South America's case, 25.4% of its territory is arid or semi-arid land, including 9 countries of that sector of the continent; Central America includes two countries with 7.8% of the surface area with such environments. Several countries of the region, as well as significant sectors within some countries, are presently in a state of water stress, and it is projected that this situation will worsen significantly over the medium term. The areas affected by water shortage include a great variety of ecosystems and production systems associated with rich cultural expressions. However, over time, strong desertification processes have been developing as a result of a range of circumstances, producing loss of biodiversity and agricultural productivity, erosive processes and severe alterations in the hydrologic cycles of the affected watersheds. Extreme events such as droughts and floods have contributed to accelerate this situation. Poverty and pressure on the natural resources are the main causes for the degradation of many such dry areas. Out of the 465 million inhabitants of Latin America, some 110 million live below the poverty line. Among the most common non-sustainable practices identified are: inadequate agricultural practices and soil uses, excessive use of fertilizers and pesticides, abusive grazing and intensive forest exploitation and salinization due to inadequate irrigation. All of this combined with frequent droughts and forest fires, does generally lead to land degradation. The resulting intense reduction of the ecosystems' biological productivity, leads, in turn, to a low economic productivity of agriculture, livestock and agroforestry and, thus, to increased poverty among the region's populations. Discovermagazine.com reports about desertification in Iraq. Is the Fertile Crescent Turning Into a Dust Bowl? The region today known as Iraq was once known as Mesopotamia, which means "Land Between the Rivers," and since that ancient time the land between the Euphrates and Tigris rivers has been renowned for its fecund soil and thriving farms. But now the Mesopotamian cradle of civilisation seems to be returning to desert [New Scientist]. Decades of war and mismanagement, compounded by two years of drought, are wreaking havoc on Iraq's ecosystem, drying up riverbeds and marshes, turning arable land into desert, killing trees and plants, and generally transforming what was once the region's most fertile area into a wasteland.... "We're talking about something that's making the breadbasket of Iraq look like the Dust Bowl of Oklahoma in the early part of the 20th century" [Los Angeles Times], said Adam L. Silverman, a social scientist with the U.S. military. It hasn't been scientifically proved that tank movements in the desert have helped stir up the dust, as many Iraqi experts believe. But other factors are not in dispute [Los Angeles Times]. Turkey and Syria, which are both upriver from Iraq, have reduced the flow of the Euphrates to deal with their own water shortages during the region-wide drought, while Iran has built dams on tributaries that flow into the Tigris; all this leaves less water to reach Iraq. Experts say that bitterness over Iraq's water threatens to be a source of tension for months or even years to come between Iraq and its neighbors [The New York Times]. The water shortage is causing what some Iraqi officials call an "environmental catastrophe," as farms fail, land dries up, and enormous dust storms kick up and blast through towns and cities. The crisis is also taking a toll on the wetlands that form where the Tigris and Ephrates meet. The fabled marshes of southern Iraq, drained by Saddam Hussein and then re-flooded after the U.S.-led invasion in 2003, are drying up, and the traditional Marsh Arabs who depend on them for their livelihood are being forced to leave again [Los Angeles Times]. Here is a batch of entries on desertification from Carbon Based Climate Change Adaptation Blog. This Day Online (Nigeria): Current statistics by the Federal Ministry of Environment shows that Nigeria [loses] about 600 meters yearly of its arable land mass to desert encroachment. A statement issued yesterday by Special Assistant to the Minister of Envronment, Mr Rotimi Ajayi, noted that the Minister, Mr John Odey, was worried by the state of things and charged the people to cultivate non-timber forest trees to combat desertification in the Northern belt of Nigeria. Odey gave the charge during a meeting with officials of the Forestry Unit of the ministry in Abuja, weekend. According to Ajayi, the meeting was to enable the minister appraise the unit's scope of work and gravity of the problems of desertification in Nigeria. "Deforestation has been estimated to contribute not less than 20 per cent to climate change globally and Nigeria ranks highest in Africa, on the problem of deforestation. AllAfrica.com via This Day (Nigeria): A International Centre Non Governmental Organisation (NGO), for Energy, Environment and Development (ICEED), has said that 90 per cent of the water in Lake Chad had been lost to the adverse effects of climate change. Executive Director of ICEED, Mr Ewah Eleri, who made this known in an interview with the News Agency of Nigeria (NAN) yesterday in Abuja, expressed concern at the rate at which the water in the lake was receding. He said the development was worrisome in view of the fact that the lake served as source of fresh water to more than 30 million people living around its bank. Eleri said the lake, considered to be the sixth largest in the world, is bordered by four countries, Chad, Niger, Nigeria and the Cameroon. He also expressed concern at the high rate of desert encroachment in Nigeria, saying most of the villages in the northern states had been overtaken by sand dunes. The Executive Director said that Nigeria was losing its territory at a rate of 3 kilometres per annum to the Sahara desert. ANSA (Italy): The Sahara Desert is crossing the Mediterranean, according to Italian environmental protection group Legambiente which warns that the livelihoods of 6.5 million people living along its shores could be at risk. ''Desertification isn't limited to Africa,'' said Legambiente Vice President Sebastiano Venneri. ''Without a serious change of direction in economic and environmental policies, the risk will become concrete and irreversible.'' A recent report by Legambiente estimated that 74 million acres of fertile land along the Mediterranean were turning to desert as the result of overexploited land and water resources. Legambiente said that southern Italy was at severe risk in addition to the islands of Sicily and Sardinia where 11% of all arable land showed signs of drying up. ''Semi-arid coastal regions like southern Italy are prone to the effects of desertification due to farmers' dependence on water from underground aquifers instead of rainfall,'' said Legambiente spokesman Giorgio Zampetti. According to Zampetti, pumping too much fresh water out of these underground deposits can result in seawater leaking in to replace it, effectively poisoning the groundwater. As an example of the long-term consequences, Legambiente pointed to Egypt where it said brackish groundwater had compromised half the country's farmland. 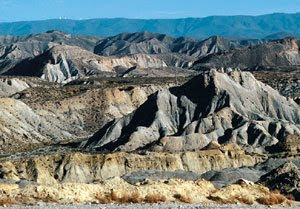 Iberia Nature reports that 37% of Spain at risk from desertification. Spain has finally implemented its first Programme of National Action against Desertification which recognizes that 37% of the country is at a very high, high or medium risk from desertification, and is in danger of becoming "eroded forever". This risk is also termed Sahelisation, after the North African region, and with coming climate change is set to worsen. Caritas.org reports about desertification in India. In recent times, the loss of vegetation in the area has vastly degraded their once fertile land, and water has become a rare commodity. Since 1999, the failure of the monsoon has adversely affected the soil and the land has become barren. In order to regenerate it, ra vines and ridges were treated by constructing gully plugs and digging out contour trenches. Earth check dams with spillways on either side were built to allow the water overflow to run off without damaging the dams. Ponds were also constructed to hold larger volumes of water. Caritas India has run public information campaigns trying to persuade local communities to take similar measures to stop desertification. Even though India's land area is only 2.4 percent of the world's total land area, it supports 16.67 percent of the world's population and 18 percent of its livestock. These pressures alone play a major role in promoting desertification. As the human and animal population increases, these stresses will become greater and the demand on natural resources will increase leading to permanent loss of vegetation and plant species. This may also lead to the conversion of large areas into wastelands and to the frequent occurrence of natural disasters. Half the land in India is now affected by desertification and this impairs the ability of land to support life. It is particularly devastating because of its self-reinforcing nature. The causes of desertification are extensive cultivation of one crop, use of chemical fertilisers and pesticides, shifting cultivation without adequate period of recovery, industrial and mining activities, overgrazing, logging and illegal felling, forest fires and unsustainable water management. Desertification is a global phenomenon of land degradation, which reduces the natural potential of the ecosystems and has a direct impact on people in terms of vulnerability to food shortages and natural disasters, depletion of natural resources and deterioration of the environment. Vegetation plays an essential role in protecting the soil, especially trees and shrubs, because their long life and capacity to develop powerful root systems assure protection against soil erosion. Their disappearance can considerably increase the vulnerability of the land to turn into a wasteland. Gentledude.blogspot.com reports about Desertification In South India. Where do we have deserts in India? Think twice before answering. Because we have a new desert coming up near the 'Garden City of India', Bangalore. This is not an ambitious project by some ambitious entrepreneur after the series of snow parks built across the country. Its true, and its natural. Kannekal and Bommanahal are like any other village in South India 150 years ago. A fertile soil that yielded two crops a year, abundant rainfall, and plentiful of grass for the livestock. Centuries ago wars have been fought for the fertile lands. But Hagari, the river that flows by the villages had severe floods for a couple of years. And with the floods came sand. The sand dunes spread across the area pretty quickly, thanks to strong winds in the area. Thus started the process of desertification. Soon rainfall decreased in the area and the sand dunes started spreading quickly. The inhabitants of these villages continued with indiscriminate use of water and instead of taking steps to conserve water, used up even more water for irrigation using bore wells. This resulted in an even faster spreading of sand dunes. Now thousands of acres of land is covered by these sand dunes. ... This place is only 400 km away from Hyderabad and 250 km from Bangalore. And at the rate it is spreading, it would reach Bangalore within 100 years according to a study. Can you imagine green Bangalore standing amidst a desert? The Guardian reports that drought land will be abandoned. Parts of the world may have to be abandoned because severe water shortages will leave them uninhabitable, the United Nations environment chief has warned. Achim Steiner, executive director of the UN Environment Programme, said water shortages caused by over-use of rivers and aquifers were already leading to serious problems, even in rich nations. With climate change expected to reduce rainfall in some places and cause droughts in others, some regions could become 'economic deserts', unviable for people or agriculture, he said. Steiner argued that only urgent action to combat global warming and poverty could prevent the creation of thousands of 'environmental refugees'. Previous UN agreements to reduce global warming emissions and the Millennium Development Goals on poverty had not been met. His warning echoes those of other environment leaders, who have said that water shortages could be the greatest threat posed by climate change. 'In many ways [water] is the most dramatic expression of mismanagement of natural or nature-based assets,' Steiner said. 'The day a person or a community is bereft of water is the day that your chance of even the most basic life or livelihood is gone and economic activity seeps away. Steiner said it was not possible to identify specific places at risk, but said vulnerable areas were those which were already considered to be 'water scarce' because of dry weather and a lack of infrastructure to store and transport water. Last week a study of the water footprints of 200 nations led by conservation group WWF warned that 50 countries were already experiencing 'moderate to severe water stress on a year-round basis'. This week experts from the UN Convention to Combat Desertification meeting in Turkey will warn that high food prices and endemic droughts are jeopardising the lives of hundreds of millions of people, particularly in Africa. Some of the most dramatic examples of water shortages this year include conflict-stricken Sudan, the dramatic drying of Lake Faguibine in Mali on which 200,000 mostly nomadic people depend, fatal clashes over drying boreholes in northern Kenya, and economic and social crisis on the sparsely populated border between Bolivia and Argentina, according to Unep. Oxfam has estimated that 25 million people have been affected by the most recent drought in Ethiopia. Rich nations are not immune. California has declared a state of emergency over water shortages, Australia has committed billions of dollars to cope with drought, and governments in Europe have been forced to ship in water to stop communities running dry. 'A plant, never mind a human being, simply cannot live without water,' said Steiner. 'It's not a matter of how we can live for three years without some water; these are not the kind of things we can do for a while and recover. My reaction: Disaster is feared as desertification spreads. 1) Desertification is the degradation of dryland ecosystems through a combination of natural and human causes. 2) Desertification occurs when human beings try to take too many resources from land that can sustain very little human life. When too many people try to plant crops, graze cattle and harvest firewood in a fragile dryland ecosystem, they tip the balance of sustainability. 3) When we talk about desertification, we're not only talking about the slow spread of existing deserts, but the creation of entirely new ones. 1) In the 1920s, when the United States entered an economic recession, farmers in Western states tried to raise profits by plowing and planting more acreage with new mechanized farming methods. 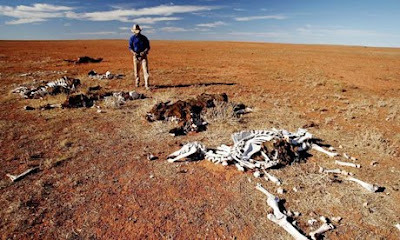 2) Within a decade, a massive drought hit the entire country. Strong winds swept across the Great Plains, stirring up loose topsoil that had been displaced by overplowing and overgrazing of cattle. The results were dozens of epic dust storms that swallowed whole cities in blinding black clouds. The semiarid soil of the plains, which had fed generations with its fertile soil, was now a lifeless desert known as the Dust Bowl. 1) New deserts are growing at a rate of 20,000 square miles (51,800 square kilometers) a year. 2) Save for the Antarctica, desertification affects all continents. 3) Nearly half of the world's total land mass is composed of dryland ecosystems (areas defined by low annual rainfall and high temperatures), and 10 to 20 percent of these regions are already degraded -- unsuitable for human, animal or plant life. 4) Dryland regions are also home to billions of the world's poorest, most marginalized populations. As these people are displaced by new deserts, they are forced into even more unstable regions, where the desertification process continues. 5) More than 70 percent of drylands in Africa, Asia and Latin America that are being used for agricultural purposes are already experiencing the effects of desertification. 6) Desertification was one the sources of e global food crisis of 2008. Degradation of available farmland contributes to less food production and higher prices for staple crops like rice, wheat and corn. 7) Desertification leads to famine, mass starvation and unprecedented human migration. 8) It's estimated that 50 million people will be displaced by desertification in the next decade. 2) Healthy, productive soil is rich with organic matter called humus (decaying organic material). When topsoil is depleted of humus, it's either too loose or too compacted, both of which can lead to destructive erosion. All the rain in the world won't help infertile topsoil. It will only wash away. A) Unsustainable farming methods. overuse of chemical fertilizers, failure to employ crop rotation and irresponsible irrigation practices rob the soil of the last of its nutrients. B) Overgrazing also contributes to soil degradation. Grasses are essential to anchoring arid topsoil in a dryland region. When animals are allowed to graze recklessly, they remove all of the native grasses, exposing the topsoil to destructive erosion forces like winds and sudden thunderstorms. C) Logging. Since firewood is the fuel of choice for many people living in developing countries, unchecked clear-cutting of forests in dryland ecosystems is common. Trees play a crucial role in anchoring down topsoil and slowing down the force of winds. When too many trees are removed, windstorms and dust storms ensue. 5) The removal of vegetation in regions experiencing desertification also has an overwhelming effect on the surface and atmospheric energy, disrupting the hydrological cycle. Basically when land is cleared of plant life, the sun heats the land a lot faster, leading to higher temperatures and less rain. 6) The greatest underlying cause of soil degradation and desertification is the explosion in world population, particularly in developing countries, which puts a deadly strain on their environment. Throughout the 1990s, dryland regions experienced a population growth of 18.5 percent, mostly in desperately poor, developing nations. 1) It is possible to slow the progress of desertification and even stop it completely. 2) Decades after the Dust Bowl, federal conservation programs were able to restore the Great Plains to fertility. 3) The first step is to replace destructive agricultural techniques at the grassroots level. Poor farming communities in developing countries need to be taught the long-term benefit s of crop rotation, the use of legumes and other cover crops to "fix" nitrogen back into the soil, sustainable irrigation methods, and techniques like terracing, which prevent water runoff and erosion in hilly, sloping landscapes. 4) The Chinese government is currently planting a nearly 3,000-mile-long (4,828-kilometer-long) belt of trees along the edge of the Gobi desert to put the brakes on dust storms and prevent dune migration. A similar "green wall" is being considered along the frontier of the Sahara. 1) The desert is sweeping into China's valleys, choking rivers and consuming precious farm land. 2) Dust storms from the Gobi desert are creating poor air conditions in Beijing, triggering allergic reactions and asthma attacks as well as negatively impacting the health of children and the elderly. 4) In China's northwest, desertification has escalated from 1,560 sq km annually in the 1970s to 2,100-2,400 sq km in the 1990s. 5) Desertification costs China about $2-3 billion annually, while 800 km of railway and thousands of kilometers of roads are blocked by sedimentation. 6) The best place to grasp the climatic and environmental changes in China is along an odd stretch of towering sand dunes just 70 km northwest of the capital. In olden times, this area was a favorite hunting ground of the imperial family, with forests and lakes for picnics. Now the woods are gone. Nearby sits the junction town of Huailai - except that no one calls it that anymore. Even on the road signs it is Shacheng - Sand City. 7) The Chinese government has responded with a huge "greening" campaign, and in the past 20 years alone, more than 30 billion trees have been planted. 8) Despite its massive spending on land reclamation and replanting, China is falling behind as rampant farming and wasteful irrigation remains common in thousands of villages across China. 9) As China's desertification problem continues to grow, the government's response is getting more desperate: Chinese authorities have begun telling hundreds of villagers that farming will cease and that they will have to give up their animals. 1) Strong desertification processes have been developing in Latin America producing loss of biodiversity and agricultural productivity, erosive processes and severe alterations in the hydrologic cycles of the affected watersheds. 2) Several countries of the region, as well as significant sectors within some countries, are presently in a state of water stress, and this situation is projected to worsen significantly over the medium term. 3) Among the most common non-sustainable practices responsible for Latin America's desertification are: inadequate agricultural practices and soil uses, excessive use of fertilizers and pesticides, abusive grazing and intensive forest exploitation and salinization due to inadequate irrigation. 2) Decades of war and mismanagement, compounded by two years of drought, are wreaking havoc on Iraq's ecosystem, drying up riverbeds and marshes, turning arable land into desert, killing trees and plants, and generally transforming what was once the region's most fertile area into a wasteland. "We're talking about something that's making the breadbasket of Iraq look like the Dust Bowl of Oklahoma in the early part of the 20th century"
3) Turkey and Syria, which are both upriver from Iraq, have reduced the flow of the Euphrates to deal with their own water shortages during the region-wide drought, while Iran has built dams on tributaries that flow into the Tigris, leaving little water to reach Iraq. 4) The water shortage is causing what some Iraqi officials call an "environmental catastrophe," as farms fail, land dries up, and enormous dust storms kick up and blast through towns and cities. 5) The fabled marshes of southern Iraq, drained by Saddam Hussein and then re-flooded after the U.S.-led invasion in 2003, are drying up, and the traditional Marsh Arabs who depend on them for their livelihood are being forced to leave again. 1) The Sahara desert is encroaching into the Nigerian landmass at the speed of 600 meters per annum, thereby threatening the country's food base. 2) Due to the high rate of desert encroachment in Nigeria, most of the villages in the northern states had been overtaken by sand dunes. 3) 90 percent of the water in Lake Chad, which is considered to be the sixth largest in the world and is bordered by four countries (Chad, Niger, Nigeria and the Cameroon) has been lost to the adverse effects of climate change. 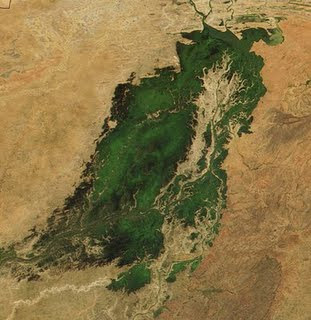 Lake Chad served as source of fresh water to the more than 30 million people living around its bank. 4) 35 percent of the Africa's total land area and 65 percent of the population is affected by desertification. 5) Over-cultivation, overgrazing, deforestation, and poor irrigation practices are leading to extensive degradation of Africa's dryland. 6) At least 25 African countries have faced serious food shortages in the past decade as a result of extended drought. 7) Environmental experts are warning of an impending humanitarian disaster in Africa, emerging from creeping desertification. 1) The Sahara Desert is crossing the Mediterranean, and the livelihoods of 6.5 million people living along its shores could be at risk. 2) 74 million acres of fertile land along the Mediterranean is turning to desert as the result of overexploited land and water resources. 3) Southern Italy was at severe risk in addition to the islands of Sicily and Sardinia where 11% of all arable land showed signs of drying up. 4) Semi-arid coastal regions like southern Italy are prone to the effects of desertification due to farmers' dependence on water from underground aquifers instead of rainfall. Pumping too much fresh water out of these underground deposits can result in seawater leaking in to replace it, effectively poisoning the groundwater. 5) In Egypt, brackish groundwater has already compromised half the country's farmland. 7) The Po River, which is Italy's longest waterway and nearly dries up in parts when industrial consumption peaks, is one of the most visible examples of desertifying climate change in Italy. 8) Spain has finally implemented its first Program of National Action against Desertification. 9) 37 percent of the country is at a very high, high or medium risk from desertification, and is in danger of becoming "eroded forever". 10) Since 2001, intensive agriculture and the spread of urbanization has lead to a huge loss in fertile soil due to erosion totaling 17 tons per hectare per year. 1) Half the land in India is now affected by desertification and this impairs the ability of land to support life. It is particularly devastating because of its self-reinforcing nature. 3) Even though India's land area is only 2.4 percent of the world's total land area, it supports 16.67 percent of the world's population and 18 percent of its livestock. These pressures alone play a major role in promoting desertification. 4) A new desert is forming near the 'Garden City of India', Bangalore. 5) This new desert is the result of continued indiscriminate water use by village inhabitants even as sand from floods and wind started covering the region. Now thousands of acres of land are covered by sand dunes. 6) This new desert is only 400 km away from Hyderabad and 250 km from Bangalore. At the rate it is spreading, it would reach Bangalore within 100 years. 2) Water shortages caused by over-use of rivers and aquifers are already leading to serious problems, even in rich nations. 4) 50 countries were already experiencing 'moderate to severe' water stress on a year-round basis. 5) Even in rich countries, people are hitting the limits of what we can do with money and infrastructure because there simply isn't enough water anymore. Lets be clear about something: desertification isn't the result of global warming (thought it is possible global warming is making it worse). The desertification we are seing, in every case, is clearly the result of reckless and extensive overuse of drylands around the world. Even if the world miraculously cuts carbon emissions to a fraction of their current level, desertification will continue as long as rampant farming and wasteful irrigation practices remain common in regions that do not support them. A) Do nothing and let food output slowly drop as agricultural land turns into sand dunes. The enormous untapped potential of Russian agricultural land stands in stark contrast with the overused farmland and desertification occurring in other parts of the world. As I reported before, Russia's agricultural sector is enormously underdeveloped. Approximately 7% of all arable land on the planet is owned either by the Russian state or by collective farms. Of that, roughly 35 million pristine hectares lies uncultivated. (A hectare is about two and a half acres.) To put that into perspective, Britain has 6 million hectares of cultivatable land. The land under till coughs up tiny yields due to poor work ethics and antiquated technology. The average Russian grain yield is 1.85 tons a hectare - compared with 6.36 tons a hectare in the U.S.
Russia is the only place on Earth that has significant amount of farmland that is not in use. I predict a situation where Russian grain increases while grain production falls nearly everywhere else. Russia will become an agricultural powerhouse (a Saudi Arabia of wheat so to speak). Consider this: if Russia's 35 million uncultivated hectares were put into production with half of the US's 6.36 tons a hectare yield, Russia's grain output would more than double. Russia's annual grain production right now is only around 90 MMT, when it has nearly 222 million hectares of agricultural land! Russia may have exported record 23 MMT of grain in 2008/09, but it has the potential to export ten times that amount. This is why I am setting up a fund to invest in Russian agriculture. While farmland around the world is either going to taken out of production due to water shortages or lost to desertification, Russia's grain output is going to explode as farmland is put into production and yields increase. This entry was posted in China, Food_Crisis, India, Key_Entries. Bookmark the permalink. What will be the effect of China's desertification on its post-U.S.-dollar-collapse development? Eric, what about the big dollar post ? I just can�t wait so see it ! Will you finish this week ? Although China will start losing manufacturing jobs after it appreciates the yuan, in the short term China will remain the world manufacturing powerhouse with a large trade surplus with virtually every nation on Earth. Even after Chinese imports become expensive, it will be hard for anyone to avoid buying "made in China" over the next two or three years. China together with Russia will come out of this financial crisis as one of the winners because demand for their exports will hold up best (ie: demand for China's cheap consumer goods and Russia's agricultural commodities is going to do well). There's - IMO - another reason desertification had spread in the 1930s in the US. And that's the New Deal of Roosevelt. He did a number of things to stop the slide in commodity prices. e.g. destroying a significant part of the cotton harvest/crop. These higher prices were an incentive for farmers to increase the acreage of farmland. Weblink. A lot of people say that the world is overpopulated. Well, the droughts will significantly reduce the number of people living on earth. Since my comments are related to both this article and the food shortage article from August 13, I decided to submit them for this article since I see that comment activity has greatly slowed down for the food shortage article. As land available for domestic production around the world becomes scarcer, it is increasingly misused and desertification and the severity of food shortages are increased. At the same time, as people around the world find it harder to purchase dollars to purchase food from other countries, more pressure is put on the limited land available for domestic production. Desertification makes the scarcity of land even worse along with a further decrease in the ability to purchase food from overseas and the positive feedback continues. US agricultural subsidies make the problem even worse as other countries are forced to become dependent on the US for their agricultural needs. This keeps food prices below those that would be set by the free market and worsens shortages at the same time as countries around the world become increasingly dependent on a limited variety of crops. The problem is made even worse if during global shortages the US stops supplying countries that are dependent on the US. During the Irish famine, the problem was not that food prices in Ireland were too low, it was that food prices in England were too low. England should have only been able to consume an amount of food equal to what they could produce and what they could gain through trade based on comparative advantage. By making available to England food that was produced using Irish land and labor, the supply of food was increased and food prices fell. At the same time, whether prices in Ireland were low or high, there would still not have been enough food. Whatever the price was whether it was low or high, it would have been too high to feed all the people. If production of luxury food for the British which used large amounts of land had been replaced by production of other foods for which land was used more efficiently, the Irish would not have become so dependent on their potato crop and both countries could have been fed. Instead, because the Irish could only afford to produce food for themselves using crops which consisted mainly of potatoes, they were left vulnerable to blights which affected that crop. The economic relationship between England and Ireland that existed in the 19th century is similar in many ways to the system of dollar hegemony that exists today. The main difference is that rather than purchasing power being extracted and transferred between countries through high prices for rents combined with the direct use of British force, this is now accomplished with high prices for dollars combined with the use of US military force. Eric is correct in that when the food shortages occur it can be accompanied either by high or low food prices. However, no price for food can cause there to be enough food if the shortage is severe enough. Just as in a lifeboat with five people and one piece of bread, some people will starve if they are not rescued regardless of any price that could be set for the price of bread. Numonic is correct in that keeping food prices too low can lead to a shortage. Attempting to keep food prices lower during a shortage than that which is determined by the market creates even more of a shortage. If the shortage is not too severe, raising prices can sometimes end the shortage. The current situation is made worse to the extent that along with lowering food prices in the US by increasing the supply of food, the supply of food that is perceived is increased even further to the extent that the agricultural futures market creates �paper food�, so prices in the US fall further. To the extent that the world food supply is decreasing because of droughts and desertification, US food prices are even farther below what they would be if a free market existed during the current global shortage. The pundits on CNBC constantly talk about food prices plunging along with the prices of other commodities because of plunging global demand. However, they ignore that from the perspective of many other counties, whether food prices are high or low they are skyrocketing when compared with their ability to pay for food. Counties that can produce only a limited variety of crops become more vulnerable to famine in the same way that Ireland became vulnerable to potato blight. When the agricultural futures market collapses along with the dollar, global food prices will move closer to prices that would be determined by a free market. Overall food production will increase as resources are used more efficiently with less wasteful production of luxury food. Fortunately for the US, there is still a relatively large potential for agricultural production. However, as dollar collapses and oil prices rise, the US will have to export a larger part of its food in exchange for the oil to meet its needs which include the need to use oil to produce and transport crops. Because of this, as other currencies rise, crops from the US will flow overseas which will lead to rising prices in the US. At the same time, prices will fall overseas to the extent that global food shortages don�t become worse. You're assuming the US won't use its control of the waves to blackmail China. What do you think the oligarchs in the US had in mind when they industrialized China and created the debt bubble? These guys have a lot of brilliant but evil brains working for them. Maybe Chineses have brains too? I don't know, just guessing.. Absolutely true - an honest and stable government is a precondition for one to keep the fruits of your labor. If the thugs are still in charge in Russia - you will not be allowed to keep your investments to yourself. This is why Russia's land is so underutilized. Who would risk investing if it becomes successful and then is stolen from you. These Russian power structures have raped their own people for hundreds of years. What has significantly changed in this respect? Hello, the Russians don't have the infrastructure to water all those crops if they were planted. In the USA there is a giant aquifer the size of alaska under the great plains. Farmers just drill and have tons of water. Problem for USA is that over the last 40 years rather than digging 15 feet they have to dig some 60 feet. Yes in 30 years if water use is not controlled or limited the USA's giant aquifer will run dry. Current use is not sustainable. Russians don't exactly have giant aquifers readily below their crops like the USA. They already use 60% groundwater and 40% surface with 20% of that mixed for their water sources. Groundwater over there is evaporating more since the water table is high. Conclusion, Russians can't grow the same amount of crops like the USA. USA also uses more chemicals and genetically modified crops, large corporate farms with technologically advanced equipment for higher yields. The Russians are gangsters and have horses to farm with still with small farms. Investing in Russia? Ready to bribe them? Yeah, US maybe sitting on a big pool of water but just because a farmer may own the land on top of it, he doesn't own the water beneath it. Just ask T. Boone Pickens who's buying aquifer rights like it ain't no thang but a chicken wang. But good points on the possibilities of the russians (russian mafia?) stealing the fruits of your labor. Unless you have DEEP connections, I'm sure that risk exists.